After sharing my Caramel Peppermint Crisp truffles and Peppermint Crisp Tart Ice Cream Sandwiches I figured you had probably had enough of the Peppermint Crisp/Caramel flavour combo. I was wrong! My recent Instagram poll has confirmed that 92% of you never get tired of a Peppermint Crisp Tart inspired treat. So I took that on board and whipped up a delicious Peppermint Crisp and Caramel Rocky Road. 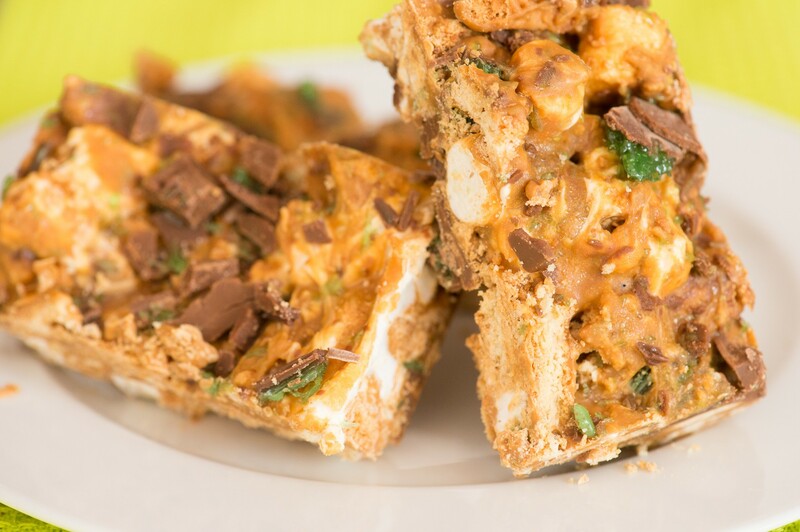 With just 4 ingredients and 15 minutes to spare, you can create these deliciously chewy, crunchy, caramelly delights. I doubt you’ll need more convincing than that, but if you do, remember they are calorie-free! Ok, that’s a lie. But they are just so yummy that you’ll forget all about those pesky calories. Grease and line a 20cm x 20cm baking tin with greaseproof paper. Break or roughly chop the chocolate, then place in a heatproof bowl and melt over a pan of simmering water. Break the biscuits into pieces. Roughly chop 3 of the Peppermint Crisp bars. Once the caramel chocolate is completely melted and smooth, remove from heat and allow to cool for a 5 minutes. Stir the biscuits and mini marshmallows into the chocolate, then lastly add the chopped Peppermint Crisp. Scrape the mixture into the prepared tin and push down with the back of a spoon to flatten the top a bit. 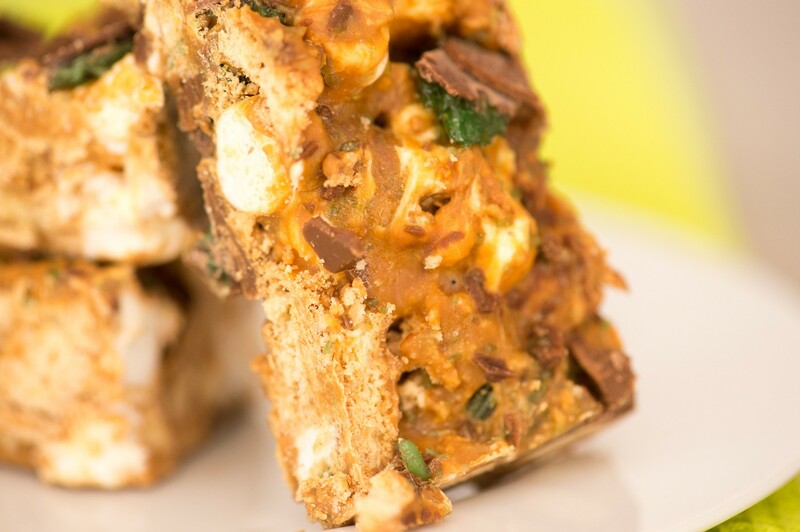 Finely chop the remaining Peppermint Crisp bar and sprinkle over the top. Refrigerate for 1-2 hours until set. 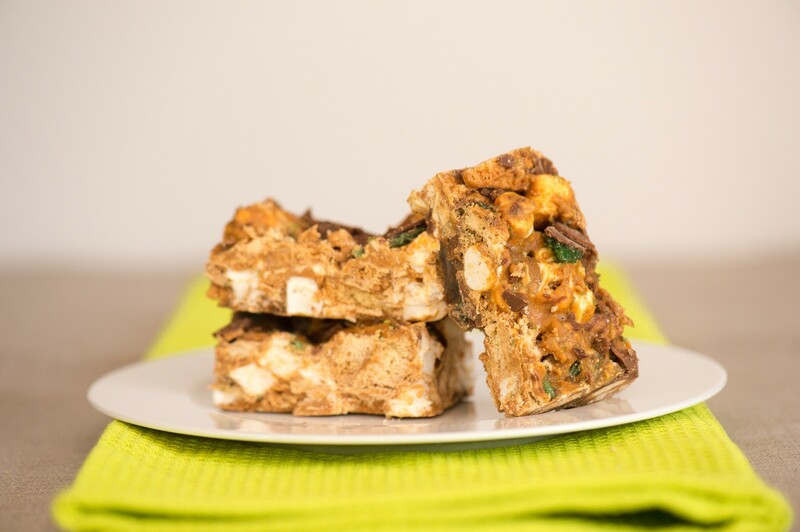 Use a serated knife to cut into squares – I find this easier if the rocky road has been left at room temperature for about 20 minutes. *You can find caramel chocolate at baking stores and some Pick n Pay’s. If you find the caramel chocolate a bit too sweet, replace half with milk chocolate and swirl the two together as you mix your ingredients.